Though still considered a niche-market item, wall-mount faucets are beginning to be a hot commodity in that corner of the plumbing industry. And since the wall-mount faucet design has begun to see a lot of love lately, Kingston Brass has been working hard to deliver more wall-mount options and styles to its customers in response to the growing popularity. 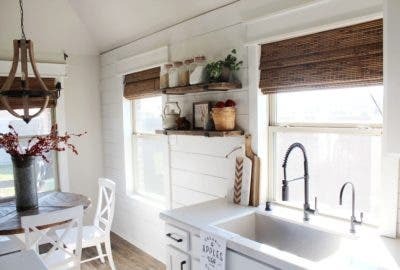 Many home owners and interior designers have jumped on the trend, making the switch from sink-mounted faucets to wall-mount faucets primarily because of its classic aesthetic that evokes traditional appeal. 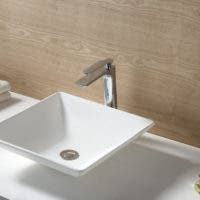 Functionally, they’re not that different from the traditional sink-mounted faucets, however, they’re extremely useful in reducing counter-top clutter, providing a cleaner look to kitchens and bathrooms. As part of an ongoing series, I’ve been highlighting some of the best kitchen faucets here at Kingston Brass. This month, lets delve into five of our most sought after wall-mount faucets, ranking them by customer popularity and ratings. Let’s start with the Heritage KS1288PL Wall-Mount Kitchen Faucet. This one didn’t quite make the Top 5 Best Kitchen Faucets list so we’re including it as an Honorable Mention. Though sporting traditional appeal with its Brushed Nickel finish, Victorian spout and porcelain lever handles, this kitchen faucet certainly stands apart from its wall-mount kin as its installation design is similar to that of widespread, sink-mounted faucets. Typically, with wall-mounts, as you’ll see from the rest of the list, they’re constructed as bridge design. This faucet, however, has a widespread design, giving it a unique flair. The KS1288PL utilizes a drip-free ceramic disc cartridge while providing a 1.2 GPM flow rate. Its spout boasts a 9-3/16” reach. This particular model comes in several finish options including Matte Black, Vintage Brass and Satin Brass. Rounding out the Best Kitchen Faucets list is the Concord KS814MB Wall-Mount Kitchen Faucet. This is actually one of my personal favorites because it comes in the stunning and stylish Matte Black finish. This wall-mount model perfectly meshes traditional elegance with modern design as it features a Gooseneck spout as well as joystick lever handles. The KS814MB is built with a drip-free ceramic disc cartridge and delivers a maximum flow rate of 1.8 GPM. The gooseneck spout has a 7-1/16” reach and 8-3/8” height. Other available finishes for this model also include Satin Brass, Polished Chrome and Oil Rubbed Bronze. The No. 4 spot goes to the Concord KS813C Wall-Mount Kitchen Faucet, which comes in the classic Polished Chrome finish. Just like the rest of its Concord family members, this faucet features the joystick-style lever handles that are more straight and cylindrical than the traditional lever handles seen on most faucets. Accompanying the contemporary design of these handles is a J-spout, giving this wall-mount a more modern look. The KS813C provides a 1.8 GPM flow rate while using a drip-free ceramic dis cartridge. The faucet’s J-spout has a reach of 6-11-16” and nearly 8” height. This model also comes in Oil Rubbed Bronze, Polished Nickel and Brushed Nickel. The Concord KS412SB takes the third spot on the list. This faucet also offers a modern take on the classic charm of the wall-mount faucet. Though its features cross handles are traditionally bare a classic vibe, their design is more contemporary, with the crosses baring the joystick-stylings that we’ve seen with other Concord Collection faucets. With its Satin Brass finish, this wall-mount offers a sultrier appeal for those who are fans of the classic Polished Brass finish. This faucet also stands apart from other wall-mount faucets with its High-Arch spout. The KS412SB comes with a drip-free ceramic disc cartridge to offer a 1.8 GPM maximum flow rate. The High-Arch spout boasts a 6-11/16” reach and 6” height. This faucet is also offered in Polished Brass, Polished Chrome and Polished Nickel. The Magellan KS213SN Wall-Mount Kitchen Faucet is ranked at No. 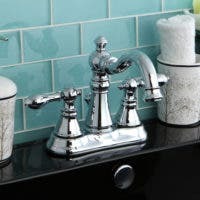 2 on the Best Kitchen Faucets list. This Brushed Nickel kitchen faucet bares the more traditional qualities of the wall-mount faucet as it features metal cross handles and a Straight spout. The popularity of this wall-mount faucet certainly can’t be denied as it evokes the vintage appeal that customers adore when it comes to these fixtures. Built with a drip-free ceramic disc cartridge, the Magellan KS213SN provides a 1.8 GPM flow rate while its Straight spout has a nearly 7” reach and 4-9/16” height. Other finish options include Matte Black, Polished Brass and Vintage Brass. And ranking at the top of the list is the Vintage KS3223AX Wall-Mount Kitchen Faucet. The reason this wall-mount is so popular is all in the name. It is truly embodiment of vintage allure. 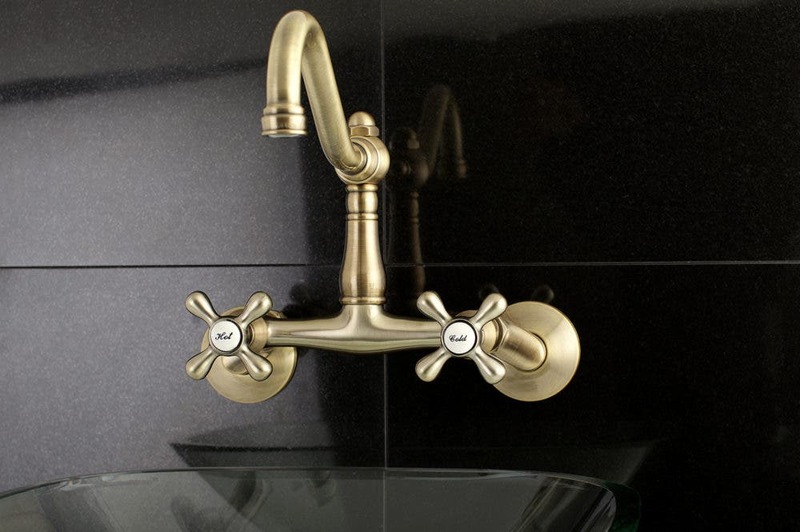 This faucet just oozes traditional appeal with its Victorian spout and cross handles. The Vintage Brass finish gives the faucet a purely antique look that’ll definitely wow guests when they come to the kitchen. The Vintage KS3223AX utilizes a drip-free ceramic disc cartridge and provides a maximum flow rate of 1.8 GPM. The Victorian spout offers plenty of sink space as it boasts an 8-1/2” reach and 7-9/16” height. This faucet comes in a variety of finish options such as Satin Brass, Polished Chrome and Brushed Nickel.